See Québec City and the surrounding area on this stunning 12- to 15-minute helicopter flight. Soar over this UNESCO World Heritage City with an exclusive sightseeing tour of Québec City’s downtown skyline and beyond, including Old Québec, the Plains of Abraham and Le Château Frontenac, plus Cap Diamant and the magnificent Saint Lawrence River. A variety of departure times are available throughout the day to fit into almost any schedule. 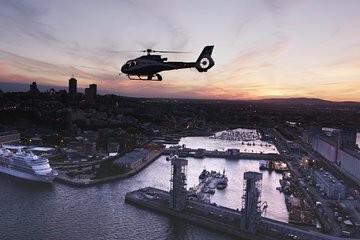 Begin this Québec City helicopter tour at the ticket office near the Jean Lesage International Airport, then head to the heliport and climb aboard a state-of-the-art helicopter. Soar high above this UNESCO World Heritage City for 12-15 minutes, enjoying the incredible aerial views of Old Québec and its fortifications, the Plains of Abraham and Le Château Frontenac. Then fly over Cap Diamant, the cape and promontory on which Québec City is located, and part of the Saint Lawrence River. The expert pilot will provide educational commentary (available in English and French) about Québec City and its many sites throughout the flight.